Having fun in Stuttgart. Photo by Linda Cabasin. Stuttgart, the charming town in southwest Germany, is the place to come for fancy cars, massive beer festivals, and wines with a view. STUTTGART, Germany — I love a good party, so I lept at the chance to attend Stuttgart’s Canstatter Volksfest, a grand beer festival that celebrated its 200th in 2018. Also luring me were the Porsche and Mercedes-Benz museums (I love fast cars, too), the promise of vineyards draping leafy city hillsides, and a chance to sample the arts scene in a cultural powerhouse. 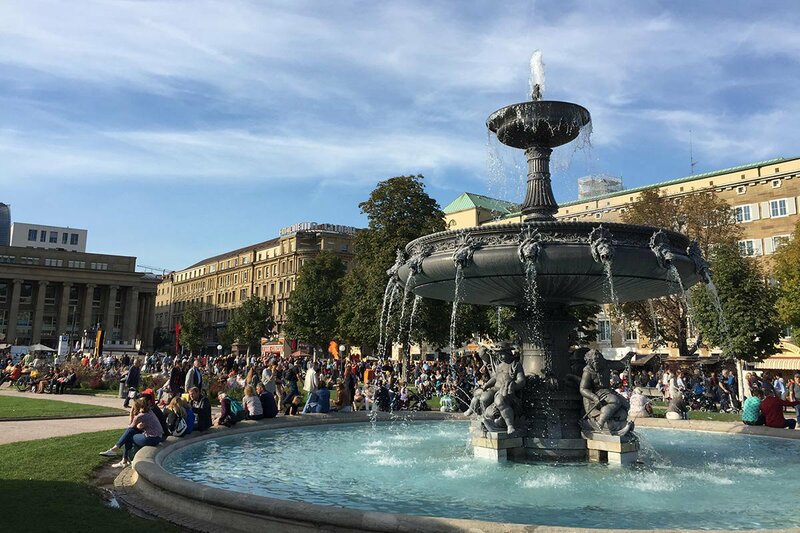 Being in Stuttgart during the September-October festival was like joining a large (four million people attend the seventeen-day event; Munich’s Oktoberfest has six million), cheerful family party that took over the city — in a good way. The fall days were sunny; people dressed in lederhosen and dirndls (technically borrowed from Bavaria); and visitors from all over explored the city’s parks, excellent museums, and reborn neighborhoods. Stuttgart is hardworking and affluent, and people also like their food, drink, and leafy green spaces. It had a happy, welcoming vibe. Fountain on the Schlossplatz. Photo by Linda Cabasin. Stuttgart (population 600,000), capital of the state of Baden-Württemberg in southwestern Germany, nestles in the Neckar River valley. From the main train station, I could look up at green hillsides with houses and, amazingly, patches of vineyards. The elegant Schlossplatz (Palace Square), the heart of the compact center city, has lawns as well as buildings, including the baroque Neues Schloss (home to government offices) and the neoclassical Königsbau (now an upscale shopping center). 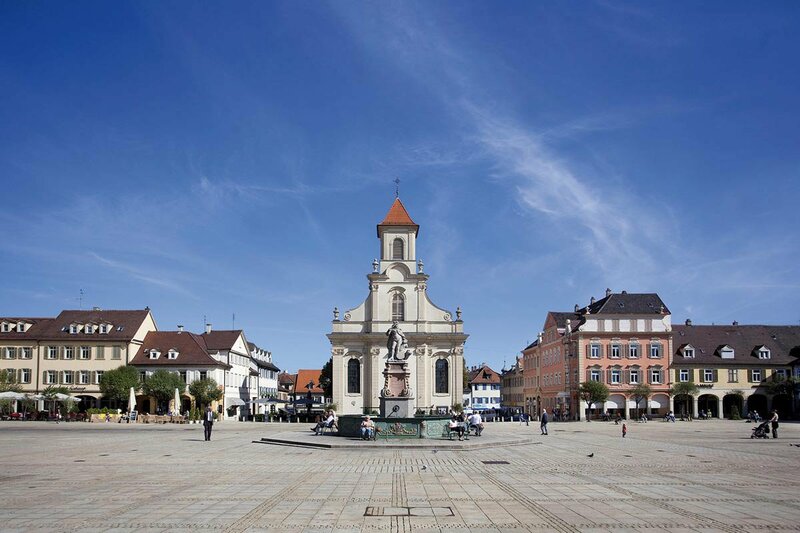 Historic charmers like Schillerplatz square are nearby. The green Schlossgarten, perfect for a stroll, runs north toward the train station, as does Königstrasse, a pedestrianized shopping street. Because of its industrial power, Stuttgart was bombed in World War II. Some buildings have been re-created, while others are strikingly modern or nondescript. What pulls the city together is the setting: Views of the hills are everywhere. The beer festival is pretty great, if you’re here in the fall, as is the Schlossplatz, anytime. But to appreciate what makes Stuttgart unique, head out beyond the city center, whether you go up for a view at Killesberg Hill Park or explore a neighborhood like Marienplatz, south of the center, where you can also take a rack railway up to Degerloch for a view. Stuttgart has begun a massive railroad and city redevelopment project, Stuttgart 21, so the area north of and surrounding the train station is a construction site. Sidewalks on some streets were disrupted; pedestrian underpasses are useful. Staatsgalerie New State Gallery. Photo by Linda Cabasin. Porche Museum. Photo by Linda Cabasin. Mercedes Museum. Photo courtesy of Stuttgart-Marketing GmbH. Chicken at the Göckelesmaier tent at the Stuttgart Beer Festival. Photo by Linda Cabasin. The Stuttgart Beer Festival, the Canstatter Volksfest, is a 91-acre mini-city of entertainment and brews at the Canstatter Wasen fairground along the Neckar River. Some basic numbers: There are more than 20 whirling carnival rides, fifteen snack bars and beer gardens, more than 50 shops, and five massive beer tents, a wine tent — locals like wine, too — and an alpine village. There’s seating for 35,000 (Munich’s Oktoberfest seats 100,000). A spin on the Ferris wheel gave a great overview. Entrance is free, with charges for rides (€2.50 to €6) and food (€2.50 for a wurst, €10 for chicken and bread, €25 for duck and sides); Wednesdays are family discount days. For seventeen days it’s open from 11 a.m. or noon to 11 p.m. or midnight, served by efficient U-bahn transportation. What struck me was that even though the festival draws international visitors like me, it felt nicely local on a weekday night. To eat in a beer tent and join the party, you can make a reservation (essential on weekends) through the website. We had dinner in the hospitable Göckelesmaier tent: Imagine 5,000 — that’s the capacity — new pals of all ages sitting or, preferably, standing, singing, and dancing on benches (you will want to do this), eating good, solid food like roasted chicken (500,000 are devoured at the festival) with glass steins (each mass is a liter, or 33.8 ounces; about €10.50) of freshly tapped beer. Servers bustled about, hoisting multiple steins and plates of food, as an energetic band played German and English favorites like “Sweet Caroline” and German drinking songs. (How many times can you sing “Ein Prosit” and drink up? Many.) We had beer from Stuttgarter Hofbräu; local brewers at other tents were Dinkelacker, Schwaben Bräu, and Fürstenberg. The downsides: Smoking is allowed in tents, and beware of a few people teetering on the benches. All this began 200 years ago when King Wilhelm I and his wife, Katharina, started the event as an agricultural fair after the ravages of the Napoleonic wars. (The event continues, every four years, along with the beer festival.) Stuttgarters adore the fair traditions, and I saw a special, one-time Historical Volkfest in the Schlossplatz, with vintage rides and traditional music and crafts. Stuttgart has a world reputation for automotive excellence, but you don’t have to be a car fanatic to appreciate the manufacturers’ stylish museums. 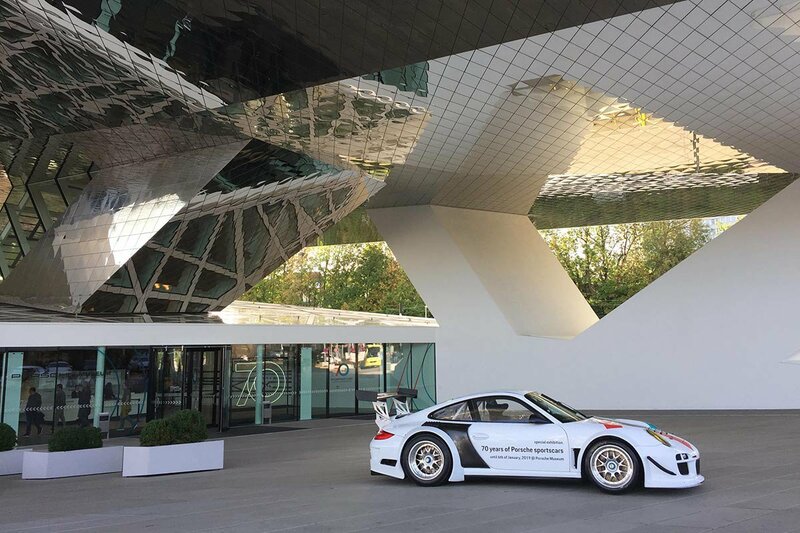 The Porsche Museum is smaller than the Mercedes-Benz Museum but spectacular; the angular white building floats above Porscheplatz (itself adorned with a car sculpture). About 80 vehicles and other exhibits — including glittering racing trophies — tell the story of these elegant, fast cars, with the help of a lively audio guide. I also saw a prototype for a future electric Porsche and learned about the designs from Ferdinand Porsche’s team that eventually became the Volkswagen Beetle. 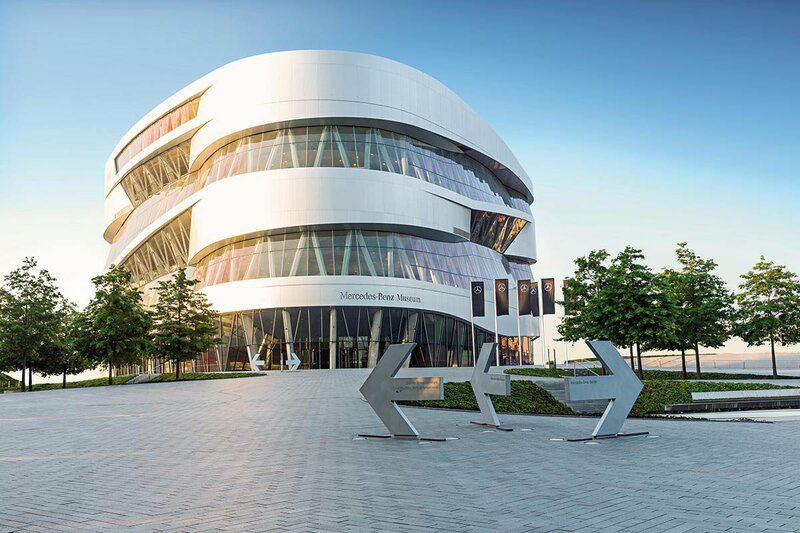 If the Porsche Museum is a boutique, the Mercedes-Benz Museum in Bad Canstatt (where Gottlieb Daimler pioneered the gas engine in the 1880s) is a department store of automotive history, with 1,500 exhibits, including 160 vehicles. You start at the top of the curving, white building — modeled after DNA’s double helix spiral — with its walls of windows overlooking the city, with the oldest vehicles and glamorous vintage cars. Famous vehicles like the Popemobile are here, along with racing cars. Spend a few hours, as there’s plenty to take in. Both museums (brand marketing at its best, for sure) have excellent gift shops and restaurants. You can also arrange factory tours; just plan ahead. S-bahn trains make it easy to get to both sights. Stuttgart is part of a wine region celebrated for red wines like fruity trollinger and lemberger, as well as whites like riesling and silvaner. The city itself owns 43 acres of vineyards, the remnant of many more. I took a hop-on, hop-off city tour for orientation and to get up in the hills around town — and exited at Burgholzhof for a Weinwanderung (vineyard walk). Smack in the midst of a residential area were slopes of vineyards, perfect for a 45-minute walk with great views. I wish I’d had more time for Stuttgart’s rustic wine taverns and the wine museum. The tourist office, the i-Punkt, on Königstrasse has information about vineyard walks. 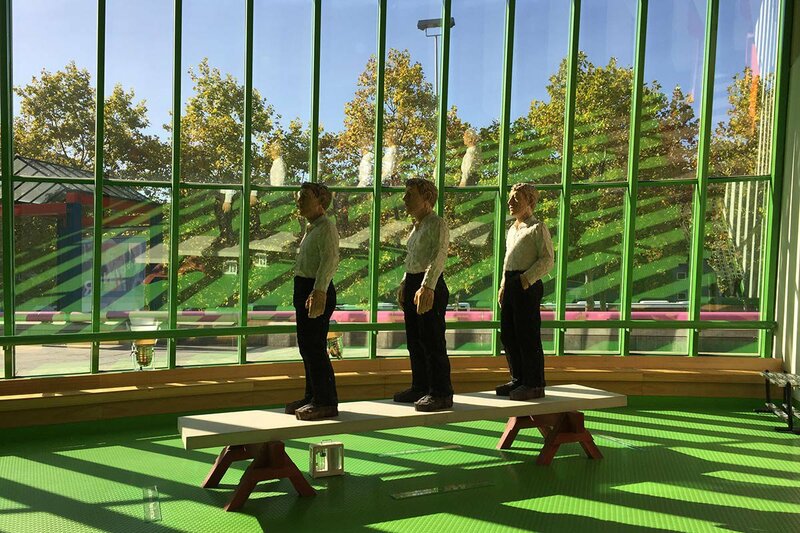 From opera to ballet to art, Stuttgart has great arts institutions, so I headed to the sprawling Staatsgalerie, housed in the neoclassical Old State Gallery and Sir James Stirling’s colorful post-modern New State Gallery building. King Wilhelm I founded the museum in the mid-19th century, and today it’s known for impressive collections of classical modernism (1900–1980; in the Stirling building) and medieval German, Italian, and Netherlandish art. I appreciated the English captions and loved seeing old master paintings and rooms of works by Picasso, Giacometti, and Max Beckman. Best of all, I discovered the work of German artist Oskar Schlemmer (1882–1943), whose costumes for an abstract dance he created, Triadic Ballet, wowed me. Tip: To cross Konrad Adenauer-Strasse to get here, take a pedestrian underpass. The glass cube of the contemporary Kunstmuseum Stuttgart, the Stuttgart Museum of Art, offers a different art experience right on the classical Schlossplatz: Some galleries are in disused tunnels. The focus here is modern and contemporary art, with many changing exhibits. Walking the boxy galleries, with light coming in from above, was fun; I also liked the amazing work by German artists, including Otto Dix (1891–1969) and Willi Baumeister (1889–1955). Although I didn’t eat at Cube, the popular rooftop restaurant, I had coffee on an outside terrace. Ludwigsburg market square. Photo courtesy of Stuttgart-Marketing GmbH. 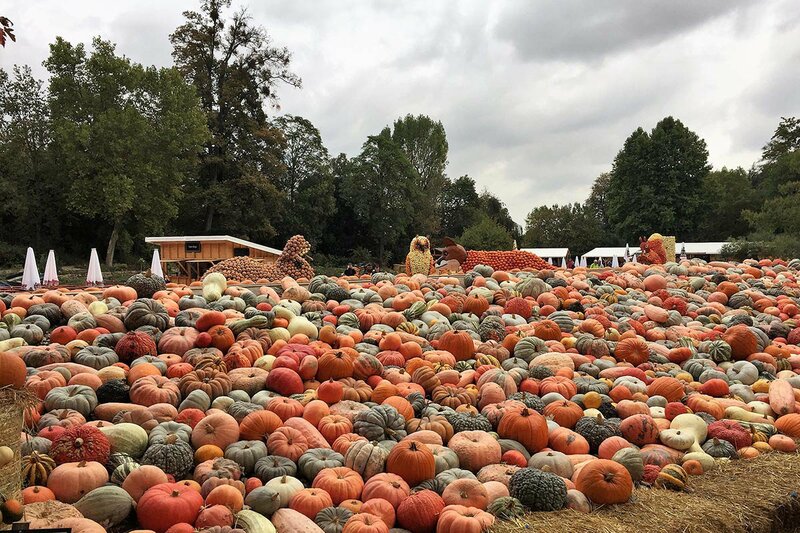 Ludwigsburg Residential Palace pumpkin exhibit. Photo by Linda Cabasin. It’s not a trip to Germany without a castle or palace visit, so I took a 45-minute S-bahn ride to Ludwigsburg, a well-preserved, planned 18th-century baroque town with a beautiful market square and the Versailles-like, 452-room Ludwigsburg Residential Palace. This creation of the powerful dukes and kings of Württemberg has baroque, rococo, and neoclassical elements. Amazingly, the palace has stayed intact, down to its exquisite wooden theater (Mozart and Casanova were here). On site are 74 acres of gardens, porcelain and fashion museums, and seventeen other buildings. You take a tour inside the palace. My English one didn’t include the King’s Apartments (highly recommended), just the Queen’s Apartments and other rooms, so check what your tour includes. Business-minded Stuttgart has abundant chain hotels but also more unique offerings. Prices increase during the beer festival. The seventeen-room Designhotel Der Zauberlehrling (“Sorcerer’s Apprentice”) is in cool Bohnenviertel, a restored historic quarter with unique shops (fashions, jewelry, crafts) and good dining, including the eponymous restaurant here. Choose your experience and amenities in themed rooms from Barolo and Sunrise to Paddington and the Hermitage. Opposite the main train station, the Steigenberger Graf Zeppelin looks like a concrete box, but comfort and full-scale modern luxury (including a spa) lie within, along with great dining at the Michelin-star Olivo. Some rooms are very traditional; others have a more modern, sleeker look. I stayed at the Aloft Stuttgart atop the new Milaneo mall and mixed-use development near the Stuttgart 21 project. My modern room, in dark neutrals, was smartly designed for comfort (the walk-in shower) and tech needs (plug and play connectivity). Multilingual staff were friendly, and there were sociable public spaces with high tops, couches, a bar, and a food area. A U-bahn stop is near the front door. 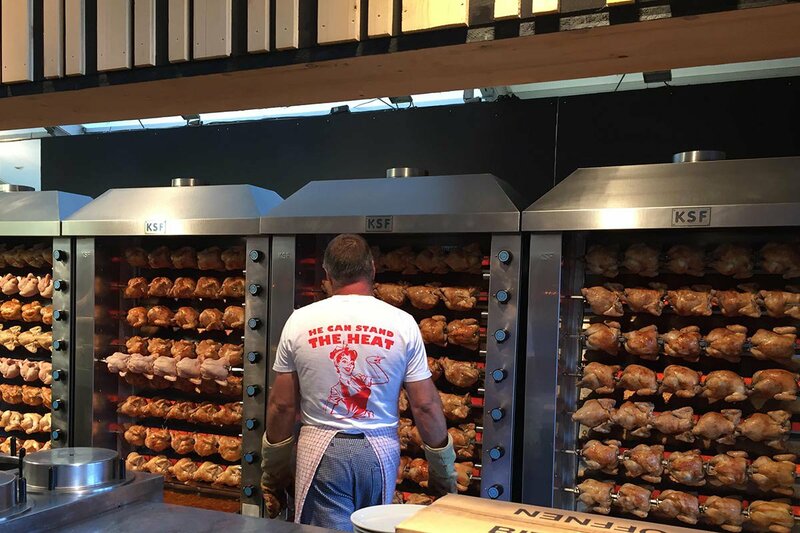 You can dine deliciously in Stuttgart on meat-focused Swabian regional favorites or Michelin-starred gourmet fare. Must-try local dishes include fried steak with onions, spätzle egg noodles (good with cheese), and maultaschen, egg-pasta packets with minced meats, spinach, and onions. Chase that beer down with a chewy brezel, or pretzel. I had beer with a view at the Fernsehturm, the 492-foot-tall Stuttgart Television Tower, atop a 1,600-foot-high hill. This city icon from 1956 has a space-needle look that was a model for many others. Tour the lofty two-tiered outdoor observation deck with views from the city to the Black Forest, then have beer, wine, or coffee and cake at the cozy Panorama Café. Leonhardts restaurant on the ground floor serves good regional favorites and local wines. Added plus: The ride here on U-bahn 15 winds up the hill, offering lovely city views. My favorite dinner was at the mellow, welcoming Goldener Adler (Golden Eagle), south of the center in a 19th-century neighborhood. This Michelin Bib Gourmand (meaning it’s a good-value option) blends tradition and modern style in its decor and cuisine. Cool lighting mixes with classic dark-wood furnishings and a curving bar. I had creamy mushroom soup, delectable maultaschen in beef broth, and local trollinger wine. 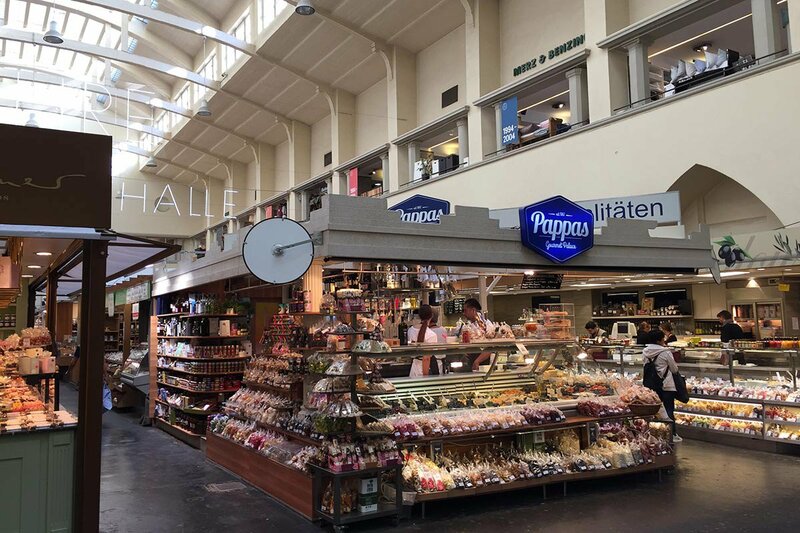 Just south of the Schlossplatz is the Markthalle (Market Hall), a two-level Art Nouveau gem from 1914 with a lofty, curved glass ceiling. Stalls tempt with gourmet produce from sausages to pastries to global delicacies. This is a great place to pick up picnic fare and food gifts like Hochland coffee. The market also has places to eat, including the intimate Marktstüble. Art Nouveau Markthalle gourmet food hall. Stuttgart Airport, nine miles south of the city center and accessible via S-bahn lines, has flights from all over Germany and Europe, though fewer from the United States. Frankfurt Airport has abundant flights from the United States; the train ride from the airport’s train station to Stuttgart is a little over an hour on a direct Deutsch Bahn (DB) train. (The city of Munich is a 2.5-hour train trip east.) Stuttgart’s main train station, Hauptbahnhof, connects with U- and S-bahn lines, buses, and taxis. Stuttgart’s crowded roads make a car a nuisance. Use the excellent public transportation system, VVS, with trains and buses, which has an app. U-bahn lines go throughout the city; S-bahn lines extend into nearby towns. Your best bet may be a day or multiday ticket. Public transportation is on the honor system but do carry a validated ticket, as fines are costly and inspectors check. A Stuttcard may save you money on sights and transit. For ticket advice, check at the tourist office by the train station. 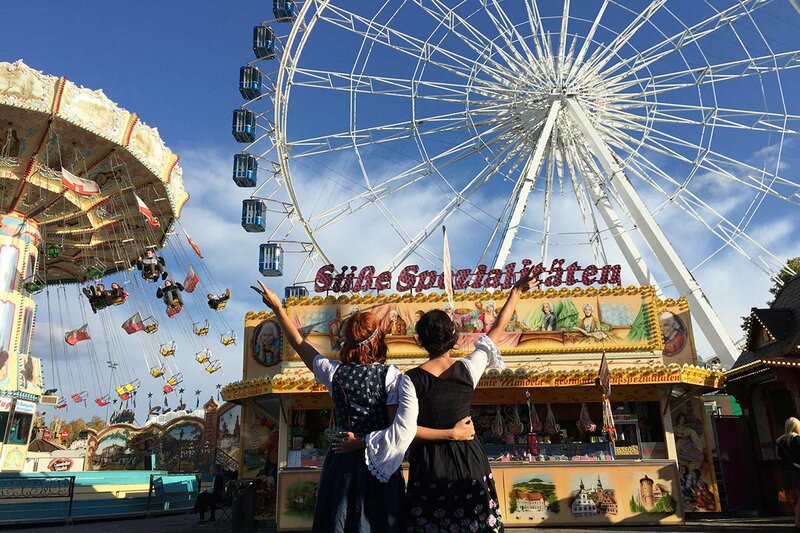 Cities like Stuttgart appeal year-round, but fall is beautiful and brings fresh beer at the seventeen-day Canstatter Volksfest starting in late September. Spring and summer festivals include summer’s Stuttgarter Weindorf, a wine-village festival downtown. Stuttgart and Ludwigsburg have superb Christmas markets. One locally beloved feature of Stuttgart’s streets is the 400+ sets of outdoor stairs, called stäffele, that climb the hilly streets and hillsides. The 19th-century steps were built to help vineyard workers navigate the grapevines. One scenic set goes from Marienplatz to Karlshöhe hill. Restaurant checks include a service charge, but you should round up to the nearest euro or leave five to ten percent tip. Giving the tip to the server or bartender directly is considered polite. Round up a taxi fare or give a euro; bellhops get a euro for helping you. Housekeeping staff should get a euro a day. Linda is a travel editor and writer who covered the globe at Fodor's before taking up the freelance life. You can follow her on Instagram and Twitter at @lcabasin. She travels for the insight gained from experiencing local culture of all kinds.